Ultra low-profile MouseBud™ connectors are lightweight, shielded and designed for use in hostile environments. Mating is a snap — simply push to mate and lock. To release, actuate the thumb trigger on the coupling ring. Plugs feature spring-loaded gold plated contacts, stainless steel shells and self-actuating bayonet coupling rings. Cable mount versions are fully assembled, shielded, overmolded and 100% tested. MouseBud is fully protected from sand and dust, moisture ingress, electromagnetic interference and a multitude of other environmental stresses. The spring-loaded contact system is rated for 2000 mating cycles. Series 860 connectors are suitable for high-speed data, power, video and audio. Panel mount MouseBud receptacles with "hot shoe" type contacts are suitable for hostile environments including soldier wearable electronics and tactical gear. Contacts are easy to clean and damage-resistant. 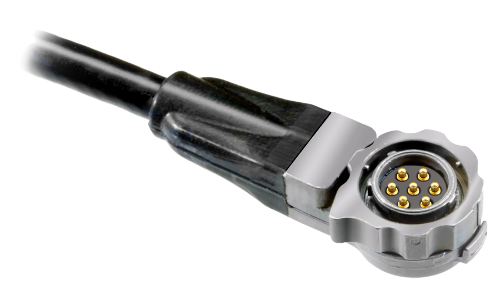 These receptacle connectors meet MIL-STD-810G requirements for reliable performance in hostile environments — both mated and unmated. Connector attaches to panel with a stainless steel jam nut. A fluorosilicone O-ring provides panel sealing. Terminate to flex circuits with PC tail terminals, or choose solder cup terminals for wire attachment. The MouseBud right angle plug features a single piece "cobra style" connector shell and a tightly fitting lid. A rubber gasket is sandwiched between the shell and lid to prevent moisture intrusion. The total height when mated to a rear panel mounted receptacle is well under 1/2 inch. Overmolded MouseBud cordsets are available in two standard versions. Style 1 cordsets feature thermoplastic polyurethane cable jackets and polyamide overmolding. Style 2 cordsets with thermoplastic rubber (TPV) cable jackets and overmolding offer excellent cold bend performance down to -55° C.